Specializing in ruminative, introspective, and cerebral tracks that you can still blast out your car speakers, wifisfuneral is one of the most popular and promising young artists of 2017. Signed to Alamo/Interscope Records in six months ago, wifi leaked his major label debut mixtape Boy Who Cried Wolf on August 1st to widespread acclaim. Since arriving on retailers two weeks later, two of the singles, “wya? (Remix)” featuring Ugly God and “Jackie Chan” have earned placement on Spotify’s coveted Most Necessary playlist. Today, wifisfuneral announces a nationwide headlining tour to promote the tape. The 24-date run starts in October and goes all the way into December, with stops in Miami, Los Angeles, New York City, and other major markets along the way. Joining wifi on tour are members of his Rich Life crew, including Danny Towers, 458Keez, Cris Dinero (who also produced a bulk of the tracks on Boy Who Cried Wolf), and DJ Yazmine. 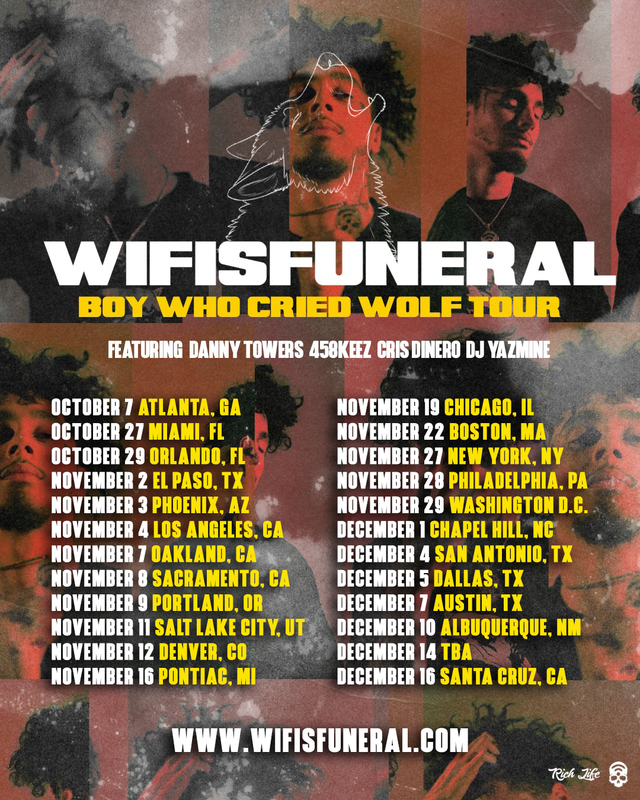 Tickets for the tour go on sale Monday, September 25, at 10AM ET and can be purchased at http://www.wifisfuneral.com/. Coinciding with the announcement of the Boy Who Cries Wolf Tour is the video for mixtape standout “LoyaltyRunsDeepInDaLongRun,” a record with personal significance for the 20-year old phenom. Produced by Mass Appeal as the first in their “Dollar Van Video” series, the video finds wifi and Cris Dinero goof around in the dollar van before getting into the song itself. The background morphs and warps into zany effects, going from a wooded forest into a video game setting. The first video off the tape, “LoyaltyRunsDeepInDaLongRun” is a strong sign of what’s to come. One of the more quietly successful artists in a burgeoning South Florida rap scene that is starting to go mainstream, wifisfuneral cemented his status as a bonafide national star with his Boy Who Cried Wolf mixtape. Featuring previously released singles such as the Joe Budden-cosigned “JoeBuddenProbablyThinksICantRap 🙁,“ the slyly self-aware “lil jeff hardy >:-),” and the posse cut “Centerfold,” which have earned more than 2 million combined plays on SoundCloud, Boy Who Cried Wolf is the next step in wifi’s evolution as an artist. Boy Who Cried Wolf is wifi’s second project of 2017, following When Hell Falls, which debuted at #17 on the iTunes Hip-Hop Chart and preceded a successful SXSW where he caught the attention of Todd Moscowitz, who signed him to his new venture Alamo/Interscope. Since signing with Alamo, wifisfuneral unleashed a barrage of high quality loose singles like “Run It Up,” which features an appearance from wifi’s labelmate Smokepurpp, and the 808 Mafia-produced, Pigeons & Planes-premiered “2 Step,” previously on Spotify’s Most Necessary playlist. Earlier this year, wifi performed at Rolling Loud festival in Miami and toured Europe with popular Taiwanese rapper Keith Ape.